Shade to retreat to at the trailhead, after a hike or bike ride. Relief from the sun at a football or soccer game. Provide sun relief to assist in a trail repair, or aid in a medical situation. Rain shelter while camping, or even quick rain delay at the kid’s game. Quick shade during that lunch break on the trail. 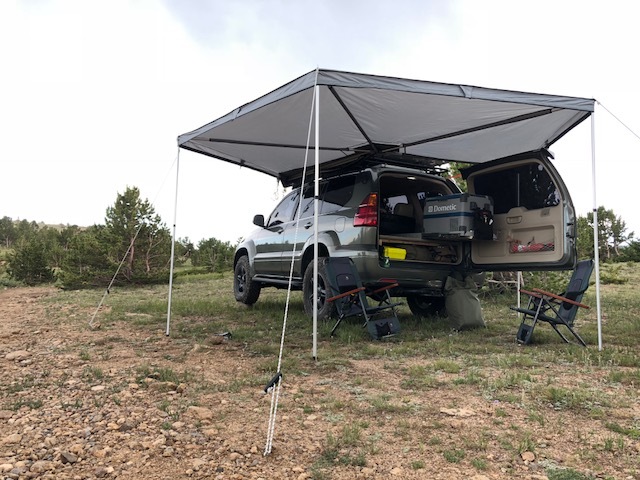 The point is, if you have a couple minutes that’s usually all it takes to make a good situation even better, as adding an awning to your overlanding vehicle, wheeling rig, soccer mom ride or mall crawler is a great way to better utilize your vehicle, and enhance your expedition. We love awnings, have owned and used several, in a variety of conditions. And we’re pleased to offer a Gamiviti branded awning in 2018, one which combines all of our most favorite attributes in a lightweight, economical package. The Gamiviti awning is a 270 degree awning, meaning is stretches out to the side, then around the back of your vehicle. We’ve tried the others, and are sold on the 270 degree option as the best solution for any awning. The material is grey 420D polyester oxford, enclosed in a UV resistant PVC sealed storage bag. the lightweight aluminum poles easily stow inside the bag, as does the bag of stakes and guy lines. Setup takes just a couple minutes and can be done easily by just one person (in windy situations, better if you have a helper). Same for stowing the awning after use, very easy to do and ample room inside the bag to zip up the awning, poles, and stake bag. Priced at $475, and ships for free with your Gamiviti roof rack. If ordered separately, we’ll contact you to confirm shipping costs (around $75 in the US). Awnings come with 2 L-brackets, which allow you to bolt the awning to just about any flat surface. For the best setup, we recommend upgrading to a pair of Gamiviti roof rack receivers, which allow you to install/uninstall your awning to your truck in less than one minute. 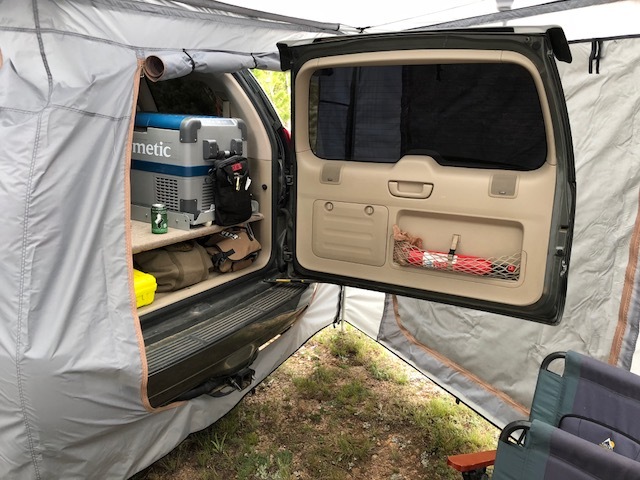 This lets you store the awning safe and secure for daily driver duty, then quickly install it when it’s time to hit the trail, head for camp, or the soccer game. Protection from the setting sun, particularly late afternoon in the desert when the sun feels like it’s at its hottest.. Shade for your fridge, & the food on the tailgate. Protection from wind- which always seems to pick up just when you’re starting dinner. Privacy- you can’t always be the only one around for miles.. and you still need to change clothes, focus on your person, or just be you. It’s nice to have a little space to yourself, even in a crowd. Awning sidewalls come with three outside doors, with full-size screens, and outer panels that can be zipped shut, rolled up, or extended by rope to be used as mini awnings. Fabric is the same grey 420D polyester oxford which is lightweight, tear resistant, and cleans easily. Inside, there’s a large opening for the side of the truck (for access to the rear door and cargo area window and a second opening for the rear hatch and tailgate area. Inside, there’s ample space to hang out and enjoy the newfound comfort, privacy, and protection of the awing sidewalls. the awning is stored inside a durable carry bag, which fits easily inside the vehicle, or inside some roof top tents. Priced at $425, with free shipping with your Gamiviti awning and roof rack.